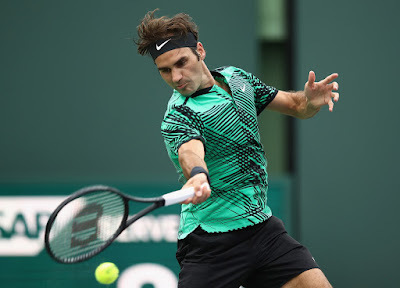 Roger Federer put on a serving clinic in edging American teen Frances Tiafoe at the Miami Open on Saturday. Making his first appearance in Miami since 2014, Federer reeled off 20 consecutive service points in the first set, claiming 80 per cent overall, to prevail 7-6 (2), 6-3. The two-time champion extended his dominant run in 2017 to 14-1, kicking off his quest for a third title (2005-06) at the Tennis Center at Crandon Park. His 45 match wins in Miami is second only to six-time champion Andre Agassi (61). Less than a week after clinching the Indian Wells crown, Federer is seeking a third Sunshine Double. Tiafoe's mettle was tested early and often and he responded well, flashing his baseline firepower and trademark charisma. But Federer was undaunted on a windy and overcast late afternoon in South Florida. The first set proceeded to a tie-break and Federer took the immediate mini-break, striking a sharply angled backhand that pulled Tiafoe well off the court. World No. 101 Tiafoe entertained the home fans with brilliant backhand passes, but the qualifier was broken for 4-2 in the second set and Federer streaked to the finish line from there. A Tiafoe return winner denied his first match point, but a service winner closed out the win after one hour and 13 minutes. Keeping points short, Federer won the majority of rallies under five shots (47-35) and fired 23 winners in total, including eight aces. A 21st ATP Head to Head encounter against Juan Martin del Potro awaits in the third round after the Argentine defeated Robin Haase in Saturday's night session. “I would love to play against Del Potro. I'm happy for him with his comeback, winning at Davis Cup. I should have played him here last year but I was sick. That was a pity. It's better to play him maybe this time around when we're both better,” said Federer. Federer and Del Potro haven’t faced each other since the 2013 ATP World Tour Finals. The Swiss Maestro leads their ATP Head to Head rivalry 15-5, but their past seven matches have gone to a deciding set. Federer has won five of their six career meetings on outdoor hard-courts, including their past four meetings on the surface.